About nine months ago, my husband and I decided to start looking for a place to live during our sabbatical in Berkeley, California. Sitting at home in Vermont, we assumed it would be no problem to find a furnished rental home for a family with four young children and a dog, within walking distance of UC Berkeley, on an assistant professor’s salary. The first thing to go was the dog. It quickly became clear that four children were four strikes against us; our dog would be a deal-breaker, and would have to stay in Vermont. The next thing to go was our budget, which turned out to be unrealistically low for most two-bedroom houses within the Berkeley city limits. Our upper limit edged higher, then higher still. Several times, we thought we’d found “the one.” But multiple rentals slipped through our fingers, usually with landlords making excuses after we mentioned the children. By late July, we were losing hope. Then my husband found an online listing for a two-bedroom house, walking distance to campus, at the uppermost limit of our budget. Without much optimism, he sent off an inquiry. That’s how we found our house. Our Berkeley house is on the north side of the UC Berkeley campus. North Berkeley is called the “Gourmet Ghetto” due to its status as the birthplace of California cuisine: the business district along Shattuck Avenue features Alice Waters’ Chez Panisse restaurant, the original Peet’s Coffee, and the Cheese Board Collective. To visit us, drive uphill from the Gourmet Ghetto. Keep going up. And up. The city of Berkeley is slanted, plunging from the Berkeley Hills to the San Francisco Bay. Our house sits mid-slope, on the corner of Cedar and Euclid – a corner so steep that someone in Public Works decided navigating it would require two sets of stairs in the sidewalk at our corner. The house is a semi-detached, two-story wooden structure, painted dark brown. Our landlords, Jake and Keturah and their two children (who are as wonderful as their initial email indicated) live next door; the two houses are connected by two garage bays. Both houses were built in 1939, which doesn’t seem old by East Coast standards, but does seem old if nothing’s been updated since 1939. When you enter our house (which takes about 5 minutes, because the door lock hasn’t been updated since 1939), you might notice the smell. It’s a smell that evokes every house we’ve ever inhabited in Berkeley, and that we’ve only ever smelled in Berkeley: a sort of musty eucalyptus odor. The next thing you might notice is that, even if the sun is shining warmly outside, you feel cold inside. Sitting at our dining table, you might even feel a breeze. This is another peculiarity of every Berkeley home in which we’ve lived: they were constructed without insulation, and with single-paned windows. It’s as if the early 20th-century builders in this area mistakenly assumed they were in Southern California. And the Bay Area is not Southern California: At the moment, high temperatures range from 50-60 degrees F, and dip into the 40s at night. Once inside our house, it’s impossible to forget that you’re perched on a steep hill. You entered at ground level, but take ten steps from the front door through a narrow hallway and into the living room, and look out the window: you’re 15 feet off the ground. Take a few more steps to the next window, and you’re suddenly five feet higher. Our dining table is squished between the living room and the kitchen. The small kitchen, aside from the refrigerator and the stove, hasn’t been updated since 1939. It has the original white wood cabinets, including one with a screened door opening onto the street that used to let in the milk bottles, but now only admits drafts and slugs. 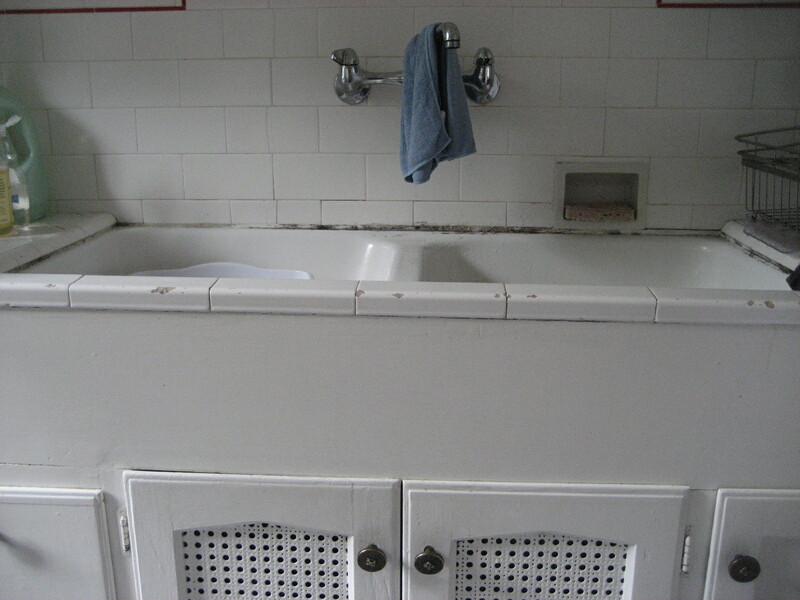 It has the original (and very chipped) white tile backsplash, counter, sink, and – from the looks of it – the original grout. Whether this is quaint or dirty is a matter of perspective. The second floor has a full bathroom and two bedrooms. My husband and I sleep on a mattress on the floor of the smaller bedroom, while our four daughters bed down in sleeping bags atop two futon mattresses in the larger room. That’s when we started noticing the gaps in our own floors, the cracks in the ceiling and walls, and the 30-degree downhill slope of our kitchen that prevents us from fully opening the broom closet. That’s when we remembered that we’re less than a mile from the active Hayward Fault, which the U.S. Geological Survey says is “increasingly likely” to produce a catastrophic earthquake within the next 30 years. Then we look out our windows and see the orange sun setting behind the Golden Gate Bridge, and -- along with our neighbors -- we forget that we’re all slowly sliding downhill.